Jeffrey Murphy, a division manager for the City of Evanston, discusses landlord obligations and organizations. 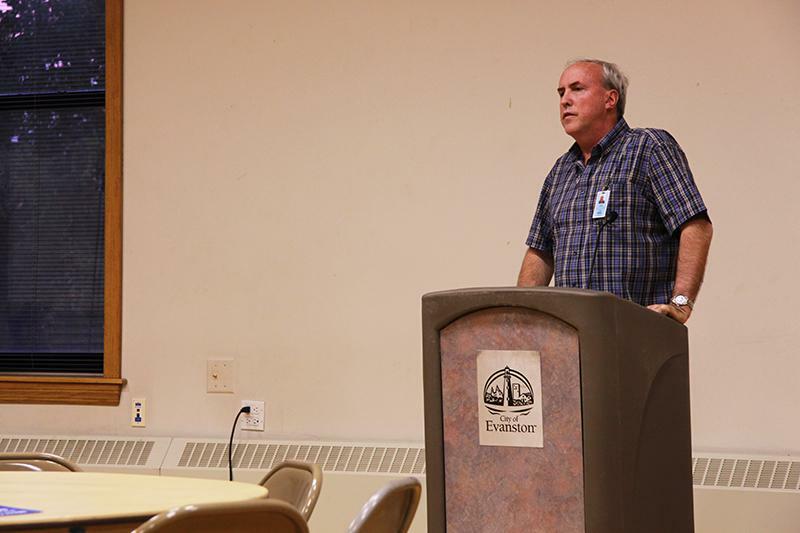 The landlord training workshop was held Thursday night at the Lorraine H. Morton Civic Center. Evanston officials and property owners gathered Thursday night to discuss nonprofit programs that landlords can use to improve living conditions for their tenants. The speakers met for a landlord training workshop at the Lorraine H. Morton Civic Center, 2100 Ridge Ave. They represented programs that will allow interested landlords to assist families in need and promote energy efficiency within their units. The officials reminded the owners of the Fair Housing Act, which prohibits a landlord from turning down potential tenants based on their income. Many people of lower income use housing vouchers issued by the government to pay their rent. Brendan Saunders, who works for fair housing group Open Communities, expressed support for the law. Saunders warned landlords about investigators who make sure tenants are not being denied based on how they pay for their housing. The speakers also introduced Connections for the Homeless, an Evanston-based nonprofit organization that provides homeless families with rental assistance while they work toward self-sufficiency. The organization has committed $500,000 to help at least 30 households over three years. Steve Greenhow, an Evanston property owner, said he found the information about poverty in Evanston to be useful. The meeting also addressed a program to help landlords make their households more energy efficient. The system allows owners of at least five units to sign up for free direct installation of energy-efficient appliances, such as low-flow shower heads and flood lamps. “Not only are you helping the environment, but you would be surprised with how much money you can save by using less energy,” said Linda Cosgrove of Franklin Energy Services.